A sturdy lamp made by a very well known manufacturer. We like this lamp for its sturdy feel and both the height and adjustability of the lampshade. The aesthetic is not to everyone’s taste but we find it fairly inoffensive. This lamp is currently rated 4 stars out of five on Amazon.com with over 400 reviews. 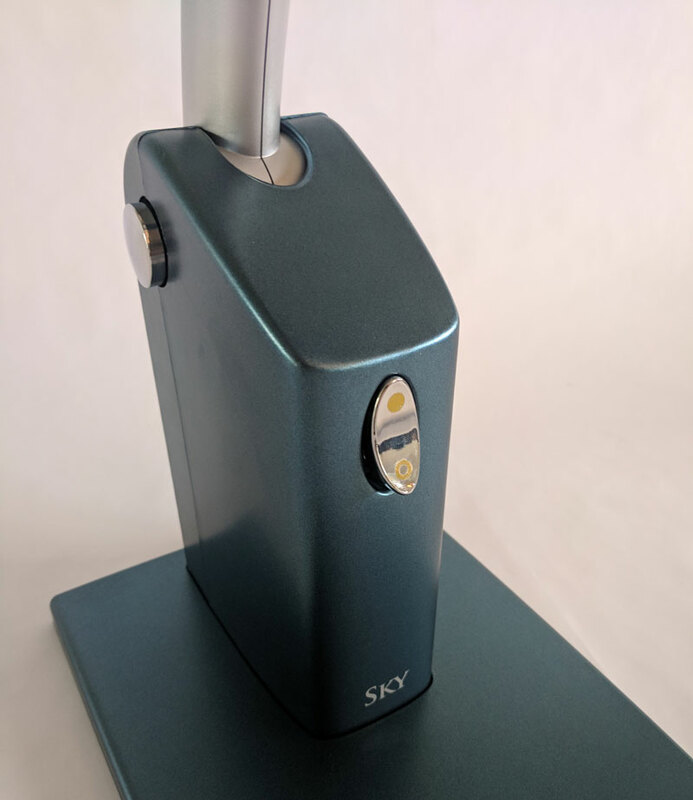 The Carex Health Brands Day-Light Sky stand allows the light to shine down into your eyes and looks more like a traditional lamp than a medical device. 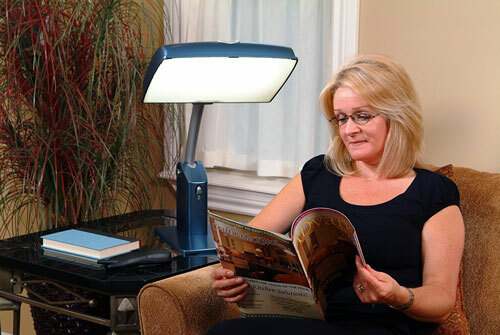 SAFE LIGHT THERAPY LAMPS. 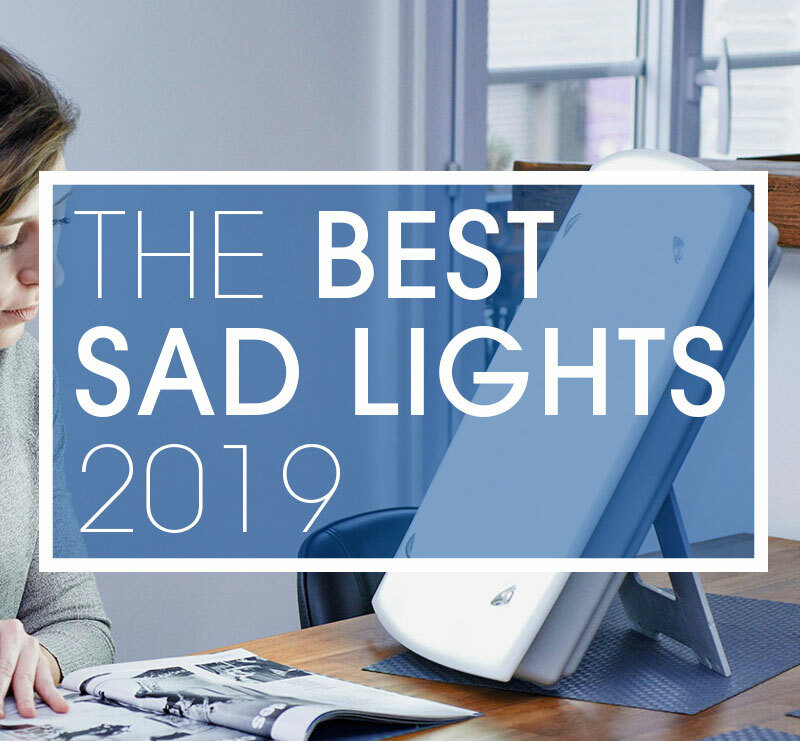 Combat fatigue, circadian sleep disorders, jet lag, shift work adjustment, and low energy with this bright light therapy lamp. 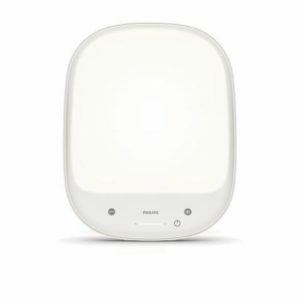 The Day-Light Sky lamp is a light box that delivers the recommended 10,000 LUX light therapy. 2 SETTINGS: The light therapy lamp offers two settings. 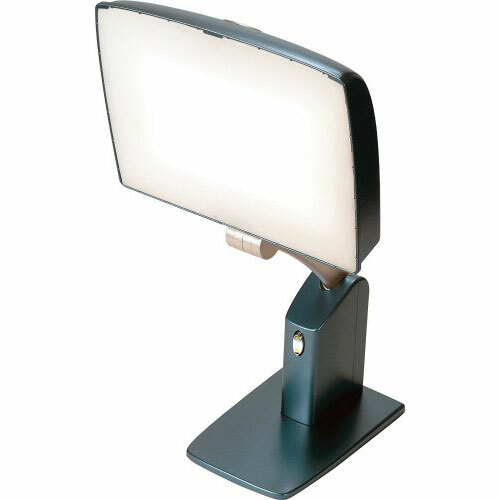 One setting provides 10000 LUX of therapeutic glare-free white light while the one-light setting provides convenient glare-free task lighting making it the perfect sunlight therapy lamp for any situation. CLINICALLY TESTED, RECOMMENDED BY EXPERTS. 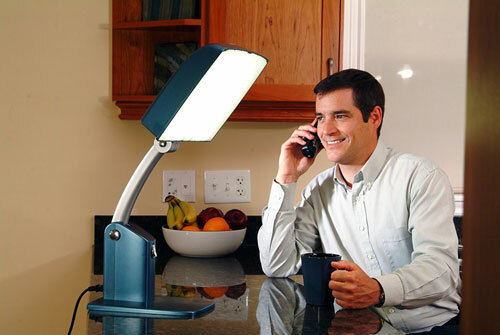 Doctors are recommending sun lamps and sunlight light therapy lamps for fatigue, jet lag, and for increasing energy. Exposure to the sunrise and sunlight is a key factor in synchronizing our bodies to the external world. 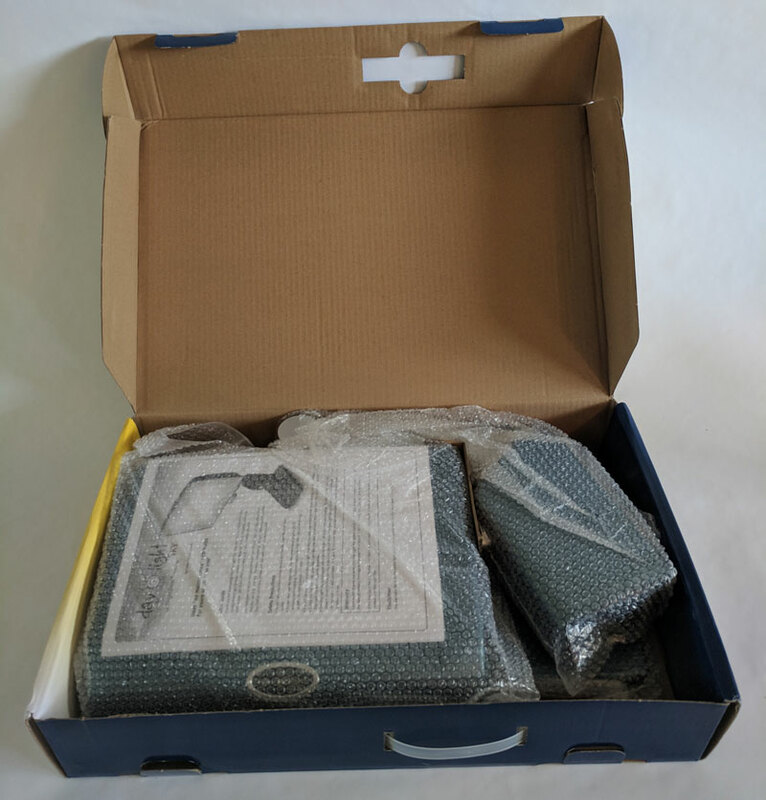 The manufacturer is Carex Health brands who are more well known for its main product lines (Health aids, mobility products, and bath safety) and have been in business for approximately 32 years. 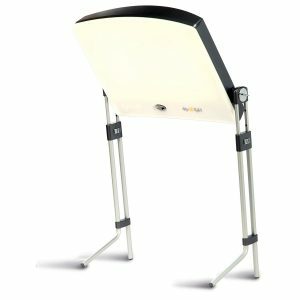 They currently have 5 different light therapy products on the market. We have also reviewed the Carex Day-Light Classic DL930 which made it into our top 5 list. 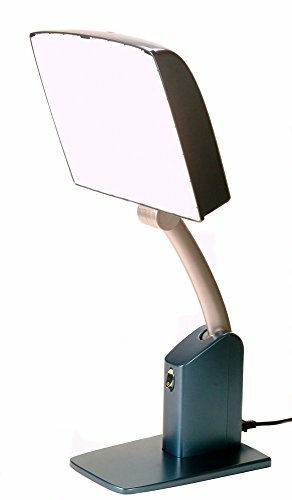 This lamp has a relatively contemporary design and looks more like a traditional lamp than a medical product. This doesn’t look out of place on your office table although we do feel it looks a little cheaper than it was intended to. 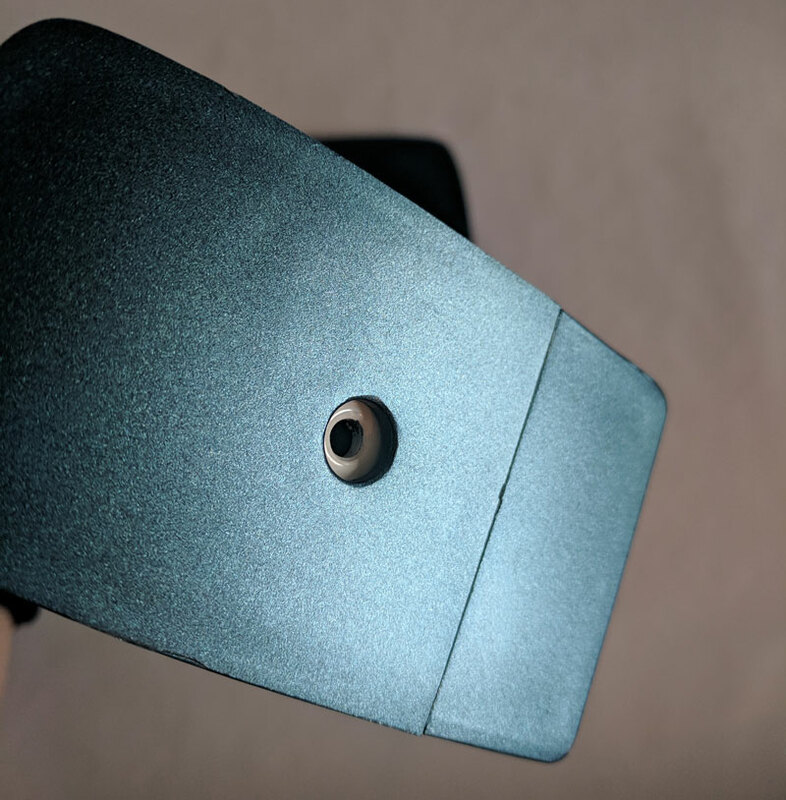 On first glance, it appears as though the lamp is made from metal but when you get closer you can see it is actually almost entirely made of plastic. You may or may not like the color choice which the manufacturers say is teal blue. It is fairly neutral although we would have preferred an alternative color. This is a large lamp and is sturdy and easy to position. The base is weighted and the lamp, therefore, feels secure when in position. The lamp shade tilts as does the neck of the lamp. It has been designed so that the light hits you from above your eye line which is claimed to be most beneficial for treating SAD. 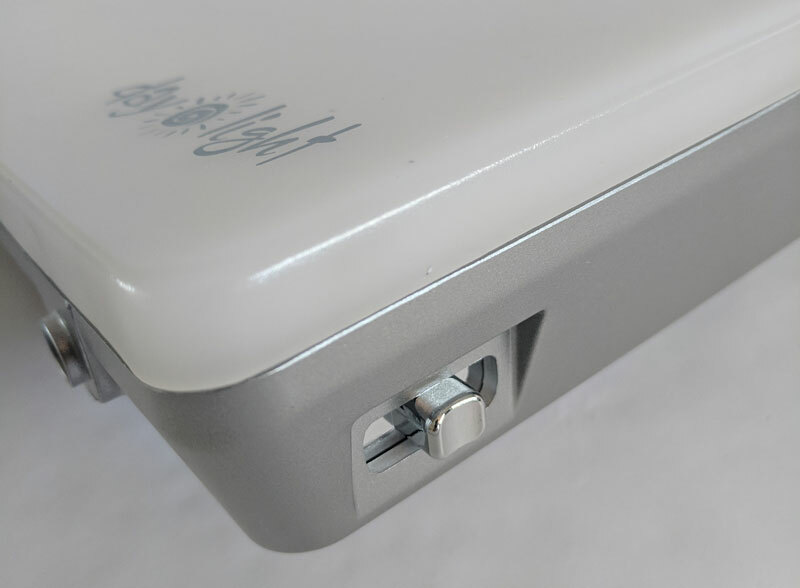 The on/off switch is located on the front of the device and is a three-way switch allowing you to select from modes 1, off and mode 2. The switch is in a reasonable position although the switch quality doesn’t feel the best. This unit was actually a little tricky to get out of the box! Surprisingly the light was top heavy when we took it out of the box. The bulbs are wrapped in packaging so this needs to be removed before use. Once unpacked this light requires a bit of manual intervention. It is easier to set up than the other carex models. The required screw and screwdriver are included in the package. You must secure the base to the light using the provided screw. From there it is a case of just plugging the power cord in, attach it to the mains power and you are good to go. The full spectrum wavelength is provided by 3 x 36-watt compact fluorescent bulbs so uses more power than some other models but the color of these lamps is nice and the UV filter screen diffuses the light nicely. The UV filtering screen blocks 99.3 of UV rays which is good. The lamp gives 10,000 Lux at 12 inches and we found it wasn’t too bright to have that close to you. There is an alternative mode which provides 6500 Lux but as always this means you need to spend longer under the lamp to get the recommended amount of light. 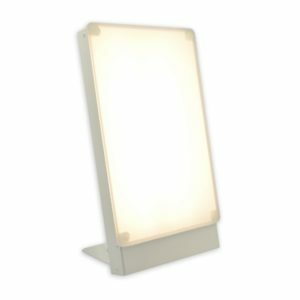 We heard about this light via an independent and non-profit group called the Center for Environmental Therapeutics who recommended this product. The lamp has two settings, 10,000 Lux and 6,500 Lux. This is a nice feature, You can use the first setting for those times you want to treat your SAD and the other setting means the lamp can be used as a task light. The switch os located on the side at the bottom of the lamp so it is easily accessible. The lamp shade can tilt so you can find the correct angle to suit you and provides a broad field of illumination. The neck also adjusts but only up and down, it doesn’t extend. The lamp only works on 110v and there is no timer function which is disappointing.